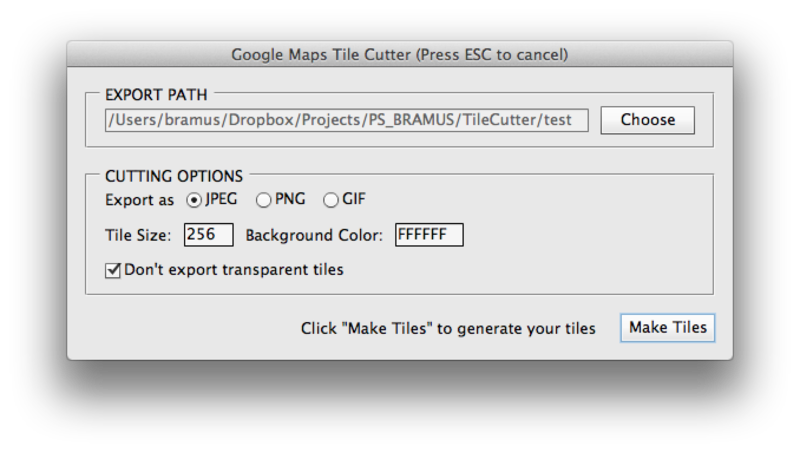 It’s been 1.5 years already since I created PS_BRAMUS.GoogleMapsTileCutter, a Photoshop Script which automatically chops up a large image into tiles for use with Google Maps. Today a huge update was released. Sparked by an initial pull request by Nick Springer, PS_BRAMUS.GoogleMapsTileCutter now sports a UI dialog in which you can set the options before starting the cutting process. In the previous version one had to change these in the source of the script itself. One of the new features that was added is the option to prevent empty tiles from being saved. Can come in handy to save bandwidth. Above that the processing was hugely improved for files with lots of layers: right before the tilecutter kicks in the whole image is flattened for much faster processing. Finally a little feedback dialog was added to give feedback during the processing the image.